This group of extensions creates new objects from one or more existing paths. Connects nodes in two paths with lines or with polygons. In the case of lines, it simply draws a line between each corresponding node in the two paths (i.e., a line between the first node of one path and the first node of the other path, etc.). If one path has more nodes than the other, the extra nodes are not used. All the lines are sub-paths of one path. In the case of polygons, a quadrilateral is drawn between corresponding adjacent pairs of points on the two lines. Each quadrilateral is a separate path. All the created paths are placed in a Group. In both cases, the original paths are not changed. See the Motion for a similar effect utilizing only a single path. 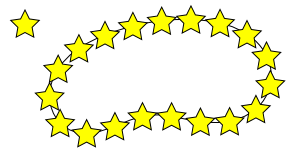 From left to right: Two star paths. After selecting both stars and using the Line option. After selecting both stars and using the Polygon option. This extension produces a blurred image of the selected object(s). It works by making multiple copies of the object(s) and insetting or offsetting the path of each copy by a different small amount. The opacity of each copy is set to a small value based on the number of copies made. The copies are embedded in a group that is left above the original object(s). Why would you want to use this extension when Inkscape now supports filters? Well, filter support in web browsers is still in its infancy. Your SVG drawings are more likely to be properly rendered using this extension. The look of the blur is also a bit different. This extension only works on paths! Convert regular shapes and text to paths before using (Path → Object to Path (Shift+Ctrl+C)). 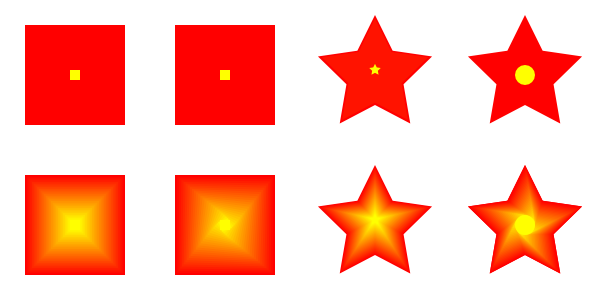 Top: Regular shapes. 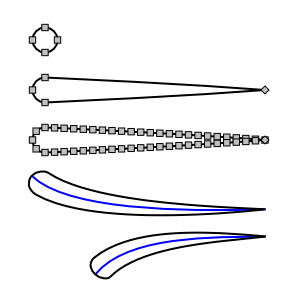 Middle: Regular shapes after using Inset/Outset Halo extension (Width: 5, Number of steps: 11). Bottom: After deleting the original objects. Text after using the Inset/Outset Halo extension to produce a shadow. The shadow has been shifted down and to the right. The color of the text was changed after creating the shadow. The original text was moved above the shadow in z-order (Width: 5, Number of steps: 11). Draws a series of lines that interpolate the space between two paths. The options include setting the number of Interpolation Steps (in-between lines), an Exponent factor that controls the spacing between interpolated paths (zero for even spacing), specifying if the original paths should be duplicated (Duplicate Endpaths), and specifying that the path style should also be interpolated. Objects need to be converted to paths prior to invoking the extension. The interpolation extension can also be used to simulate gradients of different symmetries. When calling the extension, the smaller path should be selected first. Ungroup objects (Object → Ungroup (Shift+Ctrl+G)). Combine into one path (Path → Combine (Ctrl+K)). Use Node Tool to select all nodes associated with copy in back. Break apart path (Path → Break Apart (Shift+Ctrl+K)). Group objects (Object → Group (Ctrl+G)). This extension places a pattern along one or more target paths. The pattern can be a single object or a Group of objects. See also Chapter 8, Live Path Effects (LPEs) for an alternative way of putting patterns along paths. Copies of the single yellow star are placed along a path. The star is deformed to follow the path. 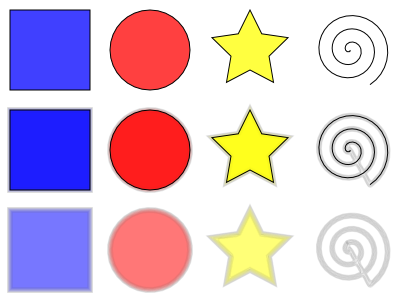 Select the pattern: The pattern can be a single object or a Group. In some cases, you may have better results if you explicitly convert all objects (e.g., Shapes) in the pattern to paths. Select the target path or paths: Called the Skeleton path by the extension author. Call the extension: A dialog will open up where various parameters can be selected. After the extension is applied there will be a new path for each object in the pattern. 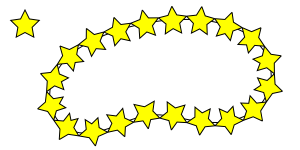 For example, the stars on the line in the above figure are formed by one path. The bounding box of the pattern is used for placing the pattern along the path, with the bounding box of one pattern copy touching the bounding box of the next copy (if no additional spacing is specified). The Pattern along Path extension dialog. The dialog is described below. Snake: The pattern is rotated and deformed to follow the path such that all points with the same horizontal (x) position in the pattern will be on the same normal (perpendicular line) to the path, and all points with the same vertical (y) position in the pattern will be placed the same distance from the path. If the Pattern is vertical box is checked, then the pattern is rotated 90 degrees first. Ribbon: The pattern is deformed only in either the vertical or horizontal direction to conform to the path. 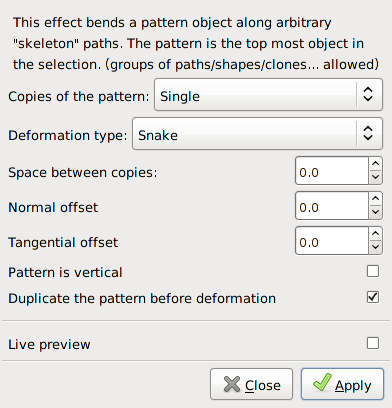 The direction of the deformation is controlled by the Pattern is vertical check box described below. Left: Snake deformation, right: Ribbon deformation. From top to bottom: Copies of the pattern: Single; Single, stretched; Repeated; Repeated, stretched. 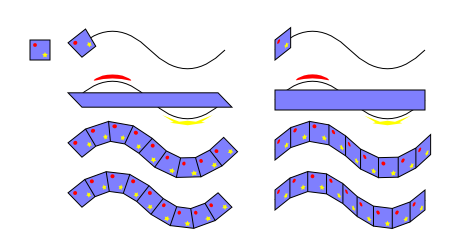 Left: Snake deformation, right: Ribbon deformation. All with spacing of 10 px. From top to bottom: Spacing only, Normal offset of 5 px, Tangential offset of 10 px, Pattern is vertical. The Pattern along Path is a very useful extension but it does have a few quirks. One is that if the pattern is moved before use, the results may be less than ideal. 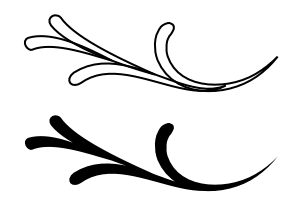 Another is that different parts of the pattern can be distorted in different ways as seen in figures that follow. The pattern at the upper left was put on the red path. Note how the distortion of the black outline is different from the blue squares. A solution in this case is to use the Add nodes extension to increase the number of nodes in the path of the black square. A pattern can be used to create a fancy border as shown below. Care must be taken that the pattern lines up at the corners. This can be done by making the distance between the corner nodes multiples of the pattern width or by breaking the path into disconnected pieces at the corners (use the Break Path at Selected Nodes ( ) option in the Node Tool Tool Controls) and using the Repeated, stretched option. Borders produced with the Pattern along Path extension. In both cases, the pattern in the center was put on a rectangle that was converted to a path. On the left, the rectangle side lengths were chosen to be multiples of the pattern width. On the right, the sides were disconnected by using the Break Path at Selected Nodes ( ) option in the Node Tool-Tool Controls on each corner node and the Repeated, stretched option was chosen. This ensured that the pattern would line up at the corners properly. From left to right: A single path with a corner point. The lengths of the sides are not multiples of the pattern width; thus, the pattern does not line up at the corner. The path converted to a compound path with two sections by using the Break Path at Selected Nodes ( ) option in the Node Tool-Tool Controls on the corner point node. Using the Repeated, stretched option, the pattern width is adjusted so that it lines up at the corner. A close up of corner showing a discontinuity due to the pattern pieces not being connected. A close up of the corner after the two nodes at the corner are connected using the Join Selected End Nodes ( ) option in the Node Tool-Tool Controls. One use of the Single, stretched option is to put text on a path. The text must be converted to a path first (Path → Object to Path (Shift+Ctrl+C)). Draw a small circle, convert to a path (Path → Object to Path (Shift+Ctrl+C)). Create a “teardrop”: Convert one node to a corner node and move to right. Adjust node handles to flatten lines. Add nodes with Add Nodes extension. Draw curves with Bezier Tool or Spiral Tool. Use Pattern along Path to put a teardrop along curves. 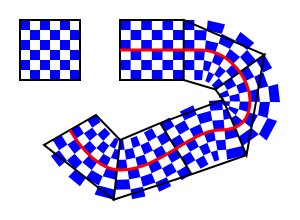 Create multiple curved teardrop paths and combine (Path → Union (Ctrl++)) to form the flourish. From top to bottom: Circle converted to path. Path with one node moved and handles adjusted. Path with extra nodes added. Teardrop path put on blue curve path. Ditto. Top: Four “teardrop” paths are in position to be combined. 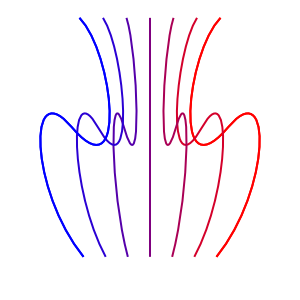 Bottom: The final flourish after combining the paths. This extension places a pattern along one or more target paths. It is almost identical to the Pattern along Path extension except that the pattern is not deformed. Copies of the single yellow star are placed along a path. The star is not deformed as it is stamped along the path. Follow path orientation: The pattern is rotated and to follow the path such that all points with the same horizontal (x) position in the pattern will be on the same normal to the path, and all points with the same vertical (y) position in the pattern will be placed the same distance from the path. If the Pattern is vertical box is checked, then the pattern is rotated 90 degrees first. Stretch spaces to fit skeleton length: Space is added between pattern copies so they fill evenly the skeleton path. Original pattern will be: Moved: Original pattern is copied, then deleted. Copied: Original pattern is copied and remains in place. Cloned: Original pattern is cloned, If the original pattern is modified, all patterns along the path will also be modified. Draws Voronoi diagrams. The line segments are derived by distributing sites (points) semi-randomly in an area and then constructing line segments where each point on the segment is equal distance to the two closest sites forming cells around each site. Average size of cell (px): The average cell size (height and width). Size of Border (px): A positive number greater than the Average size of cell results in a pattern that can be tiled smoothly. A negative number removes sites near the edge resulting in larger cells near the border. After applying this extension, you will have a Pattern that is applied to the Fill of the object that was selected. The Pattern can be shifted, scaled, and rotated like any other Pattern. It can also be applied to other objects through the Fill tab of the Fill and Stroke dialog. This extension creates a large object that may overtax your computer. 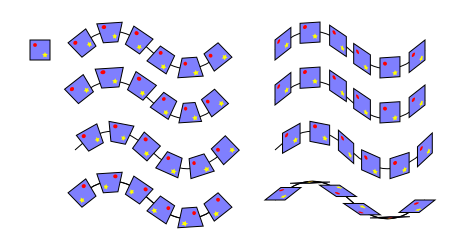 From left to right: Patterns with the default settings (size: 10 px, border: 0 px), with an average cell size of 20 px, with an average cell size of 20 px and a border of -20 px. 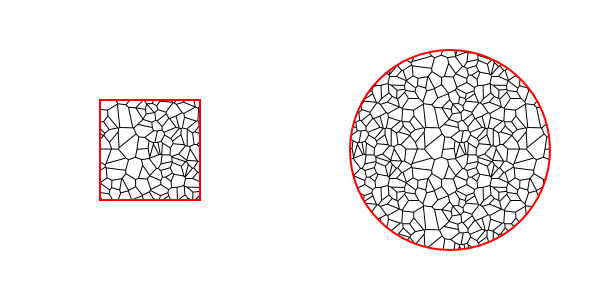 Left: A Voronoi pattern created with an average cell size of 10 px and a border size of 20 px. 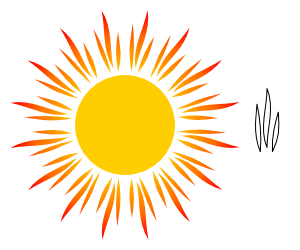 Right: The pattern applied to a circle. Note the smooth tiling.